Is it a bee, fly or wasp? Genus summary: Hylaeus (hi-LEE-us ) is a genus that is found worldwide, with around 700 identified species. There are approximately 14 species in North America. The individual species tend to be widely distributed and can be very abundant locally. 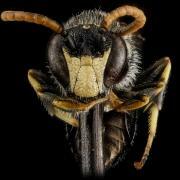 Description: Hylaeus are shiny, slender, hairless, and superficially wasp-like bees. They are small sized bees ranging from 0.2 to 0.3 inches (5 to 7 mm) long. They are usually black with bright yellow or white markings on their face and legs. These markings are more pronounced on the males. This group is called "Masked Bees" because of the small yellow diamond shaped markings on their faces. Hylaeus do not have colored markings on the abdomen. They lack pollen-carrying scopa and instead carry both pollen and nectar internally. They have two submarginal cells in their fore wing. The basal vein is not strongly arched at the base. The jugal lobe of the hind wing is about three-fourths as long as the vannal lobe. They have narrow slots or fovea running along their compound eye from the base of the antennae to the ocelli. The labrum is broader than it is long. Hylaeus females have one subantennal suture. 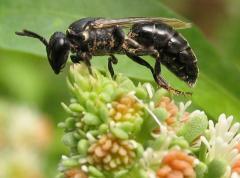 Similar insects: Hylaeus may easily be mistaken for small sphecoid wasps. Like Nomada, Hylaeus (and all bees), have branched hairs that do not reflect light, while wasps have un-branched, light-reflecting hairs that glitter in light. You can only see these hairs under a microscope. They also resemble Ceratina but are not quite so robust or shiny. Food resources: Hylaeus do not carry pollen and nectar externally; they instead store their food in the crop and regurgitate it upon returning to their nests. This way of carrying pollen makes it difficult to assess what flowers they visit (because pollen cannot be sampled from the bee without dissection), although they are suspected to be primarily generalist foragers. 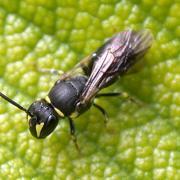 Hylaeus are short-tongued, but their small body size enables them to access deep flowers. The pollen wasps, members of the genus Pseudomasaris, also carry their pollen and nectar internally. Nests: Hylaeus nest in stems and twigs, lining their brood cells with a self-secreted cellophane-like material. There are a few species that use pre-formed cavities. They lack strong mandibles and other adaptations for digging; thus, many species rely on nest burrows made by other insects. Flight season: This genus has primarily spring bees though some persist into fall. Bees: Responsible for Every Third Bite of Food.